Update: 16th February 2010: Added “unifdef” to the list of required RPMs to build the kernel. Update: 10th September 2008: This page has been updated for the final release version of the Linux Integration Components. Update: 19th September 2008: This page has been updated for CentOS and RedHat x86_64 and x86 releases, so all 4 variations are covered. 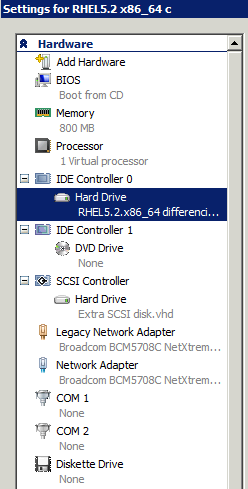 Update: 2nd December 2008: Link to Hyper-V Tools updated to 1.0 finally. Update: 22nd May 2009: This does not work with CentOS 5.3 or RedHat 5.3. This page tells you how to install the Windows Server 2008 virtualization Hyper-V Linux Integration Components in CentOS and RHEL (RedHat Enterprise Linux) 5. I initially did it all in x86_64 (or x64) as it is much more interesting and useful. There are also notes below about setting it up on 32-bit systems where there are differences. Installing the ICs in CentOS 5.2 or RHEL 5.2 is rather harder than in SuSE 10. By the time you reach the end of this guide, you will be able to use the RedHat or CentOS “setup” program and /etc/sysconfig/network-scripts/ifcfg-eth0 and ifcfg-seth0 files to set your seth0 interface as the primary interface to use in the virtual machine. You first need to fetch a copy of the ISO image from the zip of the Linux Integration Components. I strongly advise at this point that you make sure you have the latest patches and updates on your system, so do “yum update“. Next, get the kernel source for the exact version of kernel you are using. “rpm -q kernel” will tell you what kernel you have. Remember that a “yum update” may change the kernel version. For this example HOWTO, “rpm -q kernel” produced “kernel-2.6.18-92.el5” so my kernel source RPM will be “kernel-2.6.18-92.el5.src.rpm”. Once you have the the kernel version, go and find the kernel source SRPM. RedHat: You can get this from ftp://ftp.redhat.com/pub/redhat/linux/enterprise/5Server/en/os/SRPMS/kernel-2.6.18-92.el5.src.rpm. CentOS: You can get this from ftp://mirrorservice.org/sites/mirror.centos.org/5.2/updates/SRPMS/kernel-2.6.18-92.1.10.el5.src.rpm. You will obviously have to get networking working using the legacy network adapter so that you can reach ftp.redhat.com to fetch this file. If you are not sure, run that command anyway, it will not do any harm if you already have the packages installed. which will get you the full kernel source in /usr/src/redhat/SOURCES (along with all RedHat’s patches) and the spec file in /usr/src/redhat/SPECS/kernel-2.6.spec. You need to edit the spec file, so make a backup copy of it first for safety. Be warned, this will take *hours* on a on a virtual machine. 5. If nothing happens immediately, go back to step 1, just above, and try again. If either of those “rpm” commands give any errors, add “--force” to the command and run it again. Check the /boot/grub/grub.conf file, especially the “kernel” line, but no changes should be needed on simple RedHat 64-bit single-operating-system setups. Now double-check the “kernel” line, and make sure it says “pae” and not “32”. Reboot, and it should boot your newly built kernel with the X2V shims in place. The next step is to build the drivers. There are a problem that needs fixing first, the “build” link in the /lib/modules/ directory will be broken, and you need a module build environment. Note: Please note that in the preceding commands, the quotes are single backquotes, not apostrophes or anything else. Edit setup.pl and look for the string “kernel-devel”. Change that to “kernel-xen-devel” and save the file. You should now have the drivers running. If you have added a network adapter (not a “Legacy Network Adapter” to your virtual machine, you should find that “ifconfig -a” outputs a new network device “seth0”. When you reboot, the vmbus module willl automatically be started, along with the other synthetic device drivers, such as the SCSI storage driver and the network driver. Note that for that “yum” command to work with RedHat Linux, you must be subscribed to their update service so that you can fetch the package, or else you will have to go and find them on your installation DVD/CDs. You can now use the “setup” command to configure the networking and then edit the /etc/sysconfig/network-scripts/ifcfg-*eth* files to configure the new “seth0” interface to start on boot, and configure the old legacy “eth0” interface to not start on boot (set “ONBOOT=no” in /etc/sysconfig/network-scripts/ifcfg-eth0). At this point, you might want to reboot to be sure that your new network devices are configured how you expected at boot time, and that any SCSI disks specified in /etc/fstab are mounted as you expected. You now have the same ICs running in CentOS 5.2 or RHEL 5.2 as Microsoft intended to run in SuSE Linux.